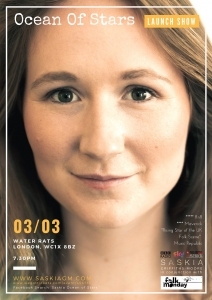 A worldwide, album launch concert is being held on 3rd March at acclaimed venue ‘Water Rats’, near kings cross, London, to celebrate the release Saskia Griffiths-Moore’s third studio album ‘Ocean of Stars’. Featuring her full, alt-acoustic band, and drawing from Roots, Americana and Folk music, Saskia’s new album touches on subjects of life and death in an unusual and positive Brit-Country style performance. Prepare for a night of celebration, friendship, reflection and original music. ‘Ocean of Stars’ itself was crowdfunded in October, reaching its goal within 5 hours of launching, and is a testament to her growing popularity, the strength of her national, and international fanbase, and a is new direction in her career. In the last four years as a full time, international touring artist, her original sound has found her featured five times on Sky TV’s Folk Show (2017, 2018), and her latest recordings received both national wide BBC promotion, as well as garnering 4 and 5 star reviews in Maverick and RnR Magazine respectively. For her sins, she has been awarded Arts Council funding three times for these tours, and currently flaunts an endorsement from Steve Agnew Instruments in the form of an interesting looking, luthier-made, parlour guitar.She now lives in London, which fulfils her need for culture, but not nature, and remains an independent and self managing artist.